Do you know what’s better than having your birthday party at Skate World in Leesburg, FL? Nothing! Having a birthday party with us is the best. What makes having your kid’s birthday party with us at Skate World the best? Keep reading and we’ll let you know all about it! Our birthday party packages are set up to make your little one feel like the king of the world! Regardless of which birthday package you choose, your birthday boy or girl is the unquestioned VIP of the event. We offer admission for at least 10 guests, party invitations, birthday cake, and more for every guest. But the child of honor gets even more. How about a Skate World t-shirt and button plus a prize wheel and song dedication? Sounds pretty great to us! Who doesn’t have great memories of a birthday party at the roller skating rink when they were a kid? It’s almost a rite of passage to invite all your friends for a day at the skating center and for good reason. Roller skating is fun, good for you, family-friendly and great for large and small groups. Our DJ plays all the hits from classic jams to the newest pop songs. And you better believe we’ll be playing the classic skating games like the limbo, four corners, and rocket ball to name a few. 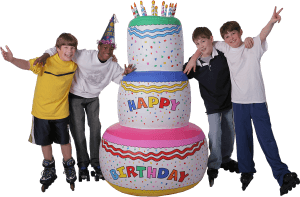 We could give a million reasons why you should consider throwing a birthday party at our skating center, but your best bet is to come down and give it a test roll. We have tons of open rink time so check us out and book your party today! Did this many years ago kids loved it. Oldest is now 40 goodness how time flies!